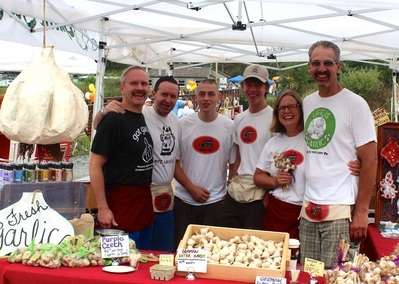 Meet the families and farms that produce and grow the garlic you are consuming. Our farmers take pride in providing their customers with the freshest picked crops, grown locally and harvested at their prime. Eat local, eat fresh! The original-garlic vinegar. A blend of fresh garlic, wholesome apple cider vinegar, and a hint of dark brown sugar. Aged in barrels, their garlic vinegar will make you happy! 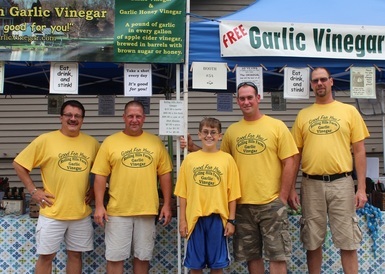 Organic garlic grown in the Poconos, gourmet garlic sea salts, assorted herbs, fresh in-season produce and farm t-shirt. NY organic garlic grower, seedling loose GARLIC and The Hooke ‘n Crooke® Garden Tool. Hooke ‘n Crooke® was developed from the frustration of having to drag multiple tools around behind me as I tended my garden. It all began with a TV program about a NY organic garlic grower, Keith Stewart, one of the longest-standing purveyors at NYC’s Union Square Green Market. 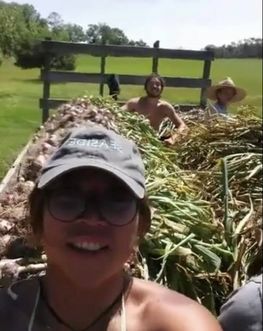 Several generations of locally grown organic garlic farmed-in the Poconos Organic garlic, hand made garlic-braids, seed for organic garlic, homemade garlic cookies and fresh in-season produce serving the community for over a hundred years! 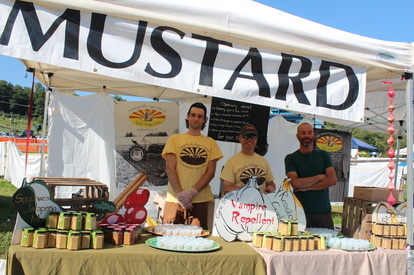 A certified naturally grown produce farm that raises pastured chicks, a poultry farm that raises pigs, a pig farm that makes artisan breads and a bakery that grows hydroponic lettuces, a sustainable family farm. Selling; GARLIC. onions, GARLIC Mustard, GARLIC Dips, GARLIC Breads, GARLIC Foccacia, GARLIC Stuffed Pretzel Rolls. Tall Oaks Farm of , PA.
Not just any garlic....more than 40 varieties of hardneck garlic, many heirlooms that originated from all around the world and found their way to America in steamer trunks, suit cases and jacket pockets of immigrants. Why? 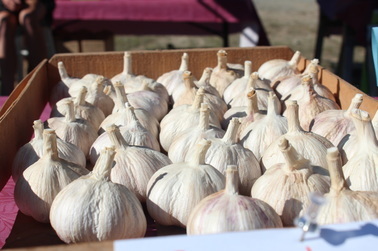 Great flavors, prolific growth habits, cold hardiness or maybe just because its GARLIC! Carlton Farms of Montrose, PA.
Carlton Farms is a diversified farm located in the Endless Mountains of northeastern PA. We are certified Biodynamic and organic! They grow small grains for human consumption, pastured lamb, pastured layers and broiler chickens, fire cider, flowers, vegetables, fruit and create exquisite salts from the herbs, flowers and other crops we grow on the farm. Beets Workin Farm is a small family farm located in Southeastern PA in the beautiful Lehigh Valley where we specialize in growing over 40 varieties of hardneck garlic. We'll have dozens of varieties available at the festival this year including many unique and hard to find varieties like Brown Rose, Red Grain, Vietnamese Red, Morado Gigante, Hungarian Purple, Metechi and Tibetan, as well as more common favorites like Music, Bogatyr, Purple Glazer, Duganski, Blanak and many more. Jeff and Diana Conover are two "back to the land" believers. Jeff is a 14th generation farmer. His family has been farming American soil since 1624. His family's first farm is in present day Manhattan, and in 1636 his ancestor moved to and became the first white settler on Long Island , owning 15,000 acres of what is present day Brooklyn.They all enjoying eating fresh, healthy food free of GMOs and pesticides and both enjoy cooking, canning and freezing the summer's bounty. 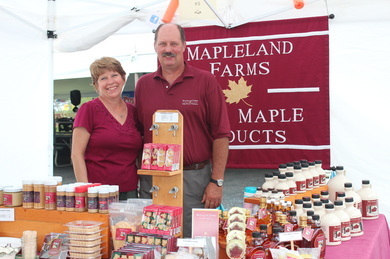 It is that love that led us to bottle some of our farm fresh goodies to sell.